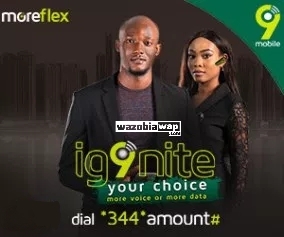 9Mobile has rebranded Etisalat Easyflex to 9mobile Moreflex, this post consist of 9mobile Moreflex Traffic plans and Migration codes, package that gives subscribers more value for making calls, browsing Pay As You Go and sending SMS to all networks. 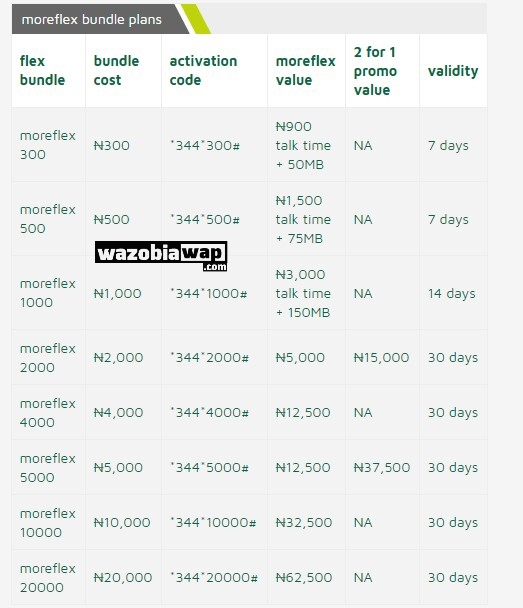 9Mobile Moreflex plan has been revamped for bigger bonuses, benefits and more value for your recharge. Where N300 recharge will fetch you 50MB data to browse and N900 Naira airtime to call any networks in Nigeria. Aside this, there are many other bigger plans under this package you can choose to opt-in to. Why you should Migrate to 9Mobile MoreFlex? You will get 150 % bonus on any purchase of flex 2000 and 5000 bundles. You will get 300 % or more when you buy flex 300 , 500 and 1000 bundles. You will get over 300 % when you buy or purchase flex 4000 , 10 , 000 and 20 , 000 Bundles. If you buy or purchase 2000 and 5000 flex bundle 2 times one after the other, you will get the third Bundle for free. If you recharge 5 , 000 and above, you will get free incoming calls while roaming on selected networks in 6 countries. UK (Vodafone), US (T- mobile ), South Africa (Vodacom), UAE (etisalat ), Netherlands (KPN ) and Saudi Arabia (Mobily ). This service valid for a month ( 30 days ). 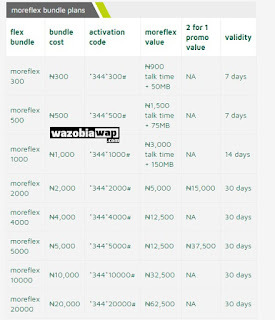 If you want to activate 9mobile Moreflex 300, which gives you N900 talk time value plus 50MB data and valid for 7 days, dial *344*300#. It costs just N300. 9Mobile moreflex works on all devices; Android, iOS, Windows, Java, Symbian, BlackBerry. Autorenewal applies to any package you subscribe to, however, you can opt out by dialling *344*0#. Moreflex doesn't stop you from enjoying other 9Mobile data services.